← Debby on…navigation, search, categories and photos. His black puppy hair is growing out and leaving behind silver and gold with black points on his ears, muzzle and tail. He’s very beautiful! He really seems to want to keep his hair long, so we will accommodate him, as long as he understands that he must be brushed, bathed and trimmed regularly. And he’s getting much better at that, too. I’m trying to learn how to trim his “bangs” in that inverted V in order to just keep his vision clear. And how to trim his muzzle hair to allow him to eat his meat and chew his bones without it clinging to him all day long! We’ll learn! (My first attempt is growing out: he was definitely a “moving target”!) There’s a great photo on my “Apso” calendar for the month of June of a beautiful silver Apso with his long hair cut in a way I’d like Zeke to wear his. And it’s obvious that this Apso in the picture has an “attitude”, too, just like Zeke. He’s not a show dog, he just likes his long hair. Sorta like the “Fonz”! From Ken:While this may sound a little strange to some folks, I must tell you what happened recently. As a pilot, I am often out of town, and must leave Zeke home to protect my wife Katy and the parrots, goats, and chickens. That is his job: sentinel. He takes his job very seriously too.One night when I was gone, the dogs in the neighborhood began barking. This is not unusual, since there are a lot of dogs in the neighborhood. There are also lots of rabbits, quail, ravens, and coyotes at which to bark. Most people who know dogs know that the alarm bark of a dog is different than the “I am bored” dog bark. Zeke will ignore the routine barking, but he listens intently to the alarm barks. These particular barks elicited a very intense reaction from him. Katy got out of bed and took him outside, where the conversation taking place was more audible. Katy asked him, “What is it Zeke? What are they saying?”Now, I know that dogs are amazing at understanding human speech and responding appropriately, but when Katy told me she received what amounted to a telepathic image from Zeke, I was skeptical to say the least. Yet as she told me the story, I had no reason to doubt her since her love and empathy for critters is well known. She was so excited that she called the hotel to tell me the story.“Bear”, she said Zeke had told her. The dogs are alarmed about a bear. Not a coyote, not a person, but a bear. Now we have never in 15 years had any bears in our neighborhood, or even close by. So I passed it off as a sleepy wife and overly protective Apso and hung up the phone.But the next day, as I drove home from the airport, there was a young black bear in a tree down the street from our house. Game and Fish, and animal control were there along with the State Police. There WAS a bear!Now I don’t pretend to know how this is possible, but it seems that Zeke communicated to my wife what he heard those other dogs say. I have no doubt that many would try to pass this off as coincidence, but I think not. It must be true. Zeke, the Apso said so. Zeke is gorgeous!!!! I have one on the other end of the spectrum…He is 12…So we did not experience together the joys (?!) of puppyhood …But I can tell you that I have never met a dog like this apso…ever, and I have taken care of many many rescue tzus and lhasas in the last few years…It makes perfect sense that he would communicate so clearly to you about the bear…My lhasa is Panchen and he is a beautiful grizzle also…When he came into my house, it was as if he always belonged here or he was coming back to me from some long lost life…He is a dear dear dog…He has only been with us a couple months…and tomorrow he goes to the groomer for the first time…Isn’t it great that Debbie added this blog to her site so we could all meet each other…!!!!!! Thank you Debbie!!! 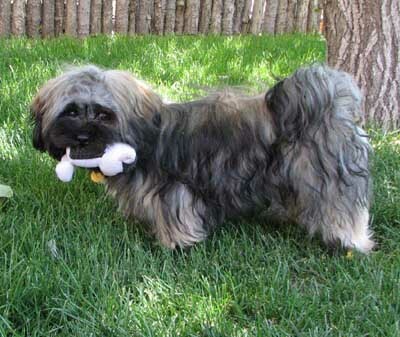 The Lhasa Apso gene pool for color is one of the more intricate. Upcoming, I will be building out the Color page on the website, integrating what’s know scientifically, along with photos. Zeke and Panchen (totally unrelated – Zeke is an FFT Lhasa – Panchen is a Gompa Lhasa Apso) probably looked almost alike, in color, at birth. Black. Panchen would have started to ‘silver’ as a young puppy, most likely around 2 months of age. Within days of Zeke’s birth, his golden coat was apparent at the base of his skin. Katy, can you scan the calendar photo and send it to me? Gail asked me about shampoo…at my grooming shop I use Bark-2-Basics, usually Melon-Cucumber. Send a photo of Panchen with his new do! Hi Debby, I enjoyed Roadie’s page. Also thank you for giving me a plug for my Mary Kay indirectly (smile). Roadie is doing fine. He now thinks he has to get up in the bed whenever I am in there. He barks, barks, barks until I pick him up an put him at the foot of the bed and he goes to sleep. Zeke continues to mature daily, getting more poised and confident, and precocious. More pictures soon…. Leslie, I am finally realizing that I am not “crazy”, that this understanding I seem to have with my dogs has been/is very real! I have been reading some books on animal communication and spirituality for about a year now, trying to learn what others know, and finding common experience. People have always told me, “you seem to know what he (dog) is thinking/saying/wants.” I am not a “psychic”, nor do I wish to become one in the sense that we usually think of crystal-gazing mind-readers (although I do know an ex-psychic, who also tells me that “you don’t want to go there”). And she has confirmed for me that what I experience is not weird, but a perfectly natural form of God-given communication that we are all, like you said, capable of, and to continue “listening” and responding. I have had many more “communications” with Zeke (as well as previous dogs). But Zeke just simply shouts sometimes! In the instance with the “bear” it was so unmistakably blatant (it was as if Zeke shouted at me “BEAR!” and I received the word and a mental image of the head of a bear) that I couldn’t be anything but absolutely convinced – and then to have it confirmed was additional proof to me. I am very much in love with this little dog and his wise ways. I’d love to hear from others about conversations with their Apsos. If anyone has any good books to recommend (I’m developing quite a reading list!) I’d appreciate hearing about that, too. Three books I love: Kindred Spirits by Allen Schoen, Bones Would Rain from the Sky, Suzanne Clothier, Blessing the Bridge, Rita Reynolds….on relationships between humans and dogs….